The Land of Stories: A Grimm Warning Release Day Media Frenzy! Re: The Land of Stories: A Grimm Warning Release Day Media Frenzy! USAToday interview Part 1 and 2. I am just going to move it to the right one. ColferInspired wrote: USAToday interview Part 1 and 2. Awesome interview. I love that Chris called out the select few little girls who are also scary adult women for writing creepy fan fic about the actors. I'm glad he said that, and hopefully people understands he's referring to crisscolfers ffs (or trying to be fair Chris/real person) and don't take it as Chris dislikes what they write about kurt, please are whole different stuff. 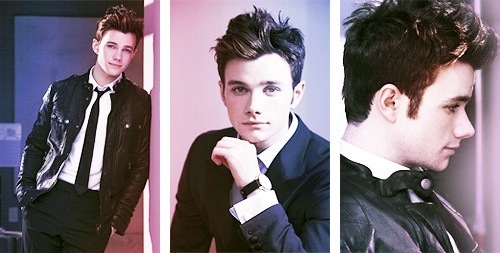 Squeals of joy, whispers of "He's soo gorgeous!" and sounds of teens hyperventilating filled the air in Powell's Books in Beaverton on Thursday, July 17, as "Glee" star Chris Colfer signed copies of his latest book. 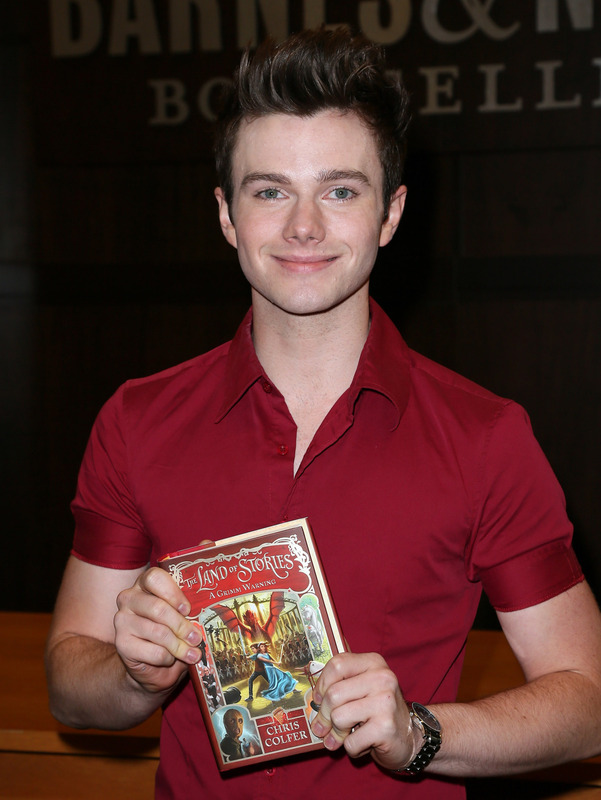 Colfer, who played openly gay student Kurt Hummel on the high school musical drama, recently released the third installment of his "Land of Stories" fairytale series, "A Grimm Warning." More than 200 fans swarmed into Powell's Books in Beaverton to meet the 24-year-old star, even though they had to buy a copy of the book at the store to get a ticket. 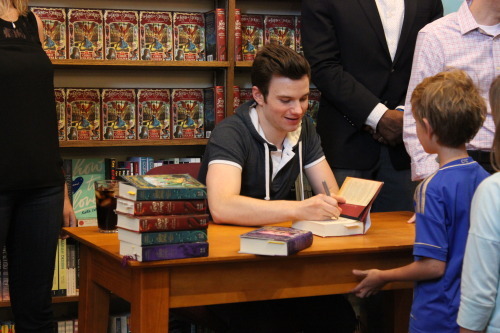 Though some attendees simply wanted Colfer to sign the books they loved, others came solely for a chance to be face-to-face with a celebrity they admired. For Elizabeth "Dede" Torres, seeing Colfer will be a bit like a high school reunion. Torres, 24, now living in Beaverton, said she attended Clovis East High School with Colfer in Fresno, and hoped he remembered her. They weren't best friends, she said, but they sat near each other in English class. "He was hilarious," she said. "Every other day, we would get in trouble for talking." Even in high school, Colfer's acting talent was starting to show, especially when he did spot-on impressions of classmates, Torres said. He would show her headshots and tell her he was headed to auditions in Los Angeles, so Torres wasn't too surprised when she started seeing him on TV. Now, when she watches interviews of him, Torres can tell he hasn't changed a bit. "He totally deserves this," she said. Posted 9 minutes ago by pochimicky. 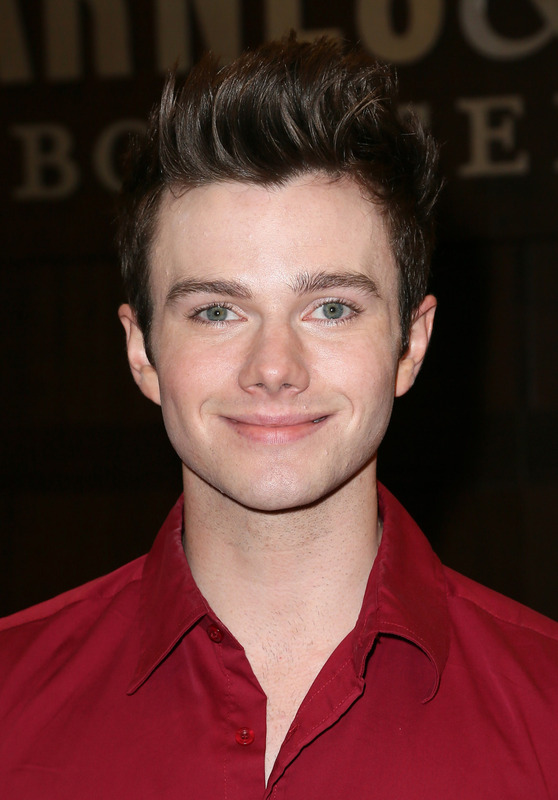 Tagged with chris colfer, the talk, tlos3 press. Cooper has grown quite a bit! Very happy with the questions...all respectful, none about Glee, mainly focused on TLOS, some quite creative. 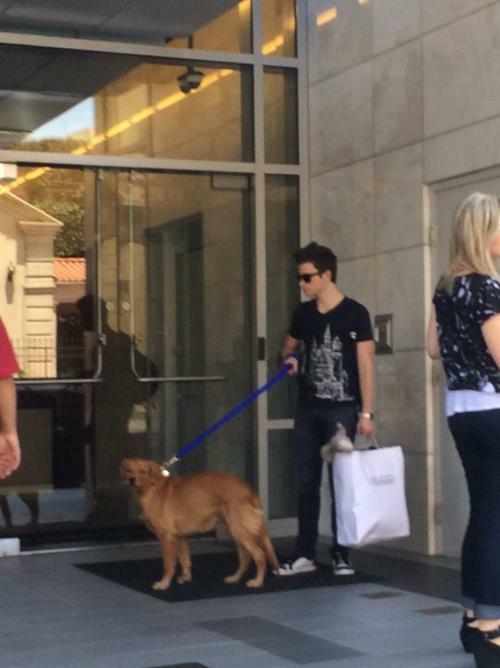 And yay Cooper! Agreed, Karen, he looks so big now. 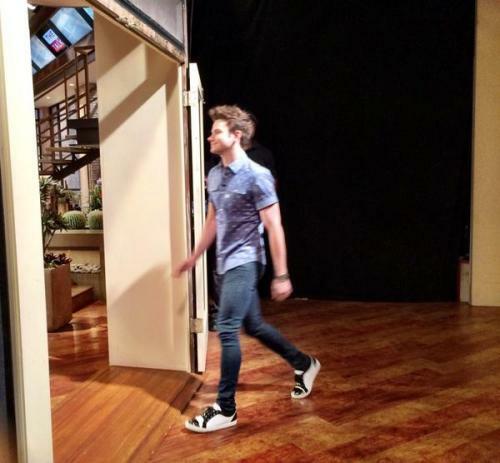 @TheTalk_CBS: . 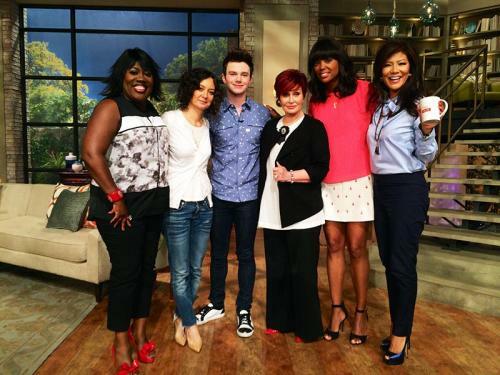 @chriscolfer on #TheTalk now! I loved the Talk interview. Near the end, Sharon just had this look on her face like she was so proud and in love with him. What inspired you to write "The Land of Stories" series? Being a very curious seven year-old is what first inspired me to explore the world after happily ever after. I never could accept an ending; I always wanted to know more - so I would create my own continuations. Do you relate to any of the characters in your book, and why? I'm a Gemini, so the main characters represent me. Alex and Conner are my Yin and Yang. Arguments they have in the books are arguments I've had with myself. There's also a LOT of me in other characters. It's very therapeutic sometimes. Everybody's dying to know, what does it feel like to be a #1 New York Times bestselling author? It feels incredible! I'm probably more proud of this than anything else I've accomplished. It's also become a very nice weapon - a "multi-New York Times Best Selling Author" is a hard title for people to belittle or discredit. Time to spill: Do you like acting or writing more? I love them both so much because they're each forms of storytelling. From what I've experienced, the problem with acting these days is that only 20% of it is the actual craft itself and the other 80% is being a "celebrity". It gets really disheartening and tiresome after a while. There's a big difference between being famous and being respected. I think people get the two confused. Whereas writing can be done in pajamas and there are less people to please. If you were stuck in a fairy tale, which one would you want to be stuck in? Sleeping Beauty without question! A kingdom cursed to sleep for 100 years sounds like a great vacation! Do you think it's important for people to take a break from reality every now and then and get lost in a good fairy tale? Absolutely! Escapism is very healthy and can save lives. I don't know how I would have survived adolescence without the Harry Potter series to dive into. My favorite part of being an author is getting to supply that. Do you ever get writer's block? If so, what do you do to overcome it? I've always known what to write but have gone through periods of not knowing how to write it. I try not to force it, getting frustrated isn't going to solve anything. I usually take a break and let the words find me. Can we expect a 4th book in "The Land of Stories" series? As of right now a fourth novel and a picture book called "The Curvy Tree" are coming! Thanks to the success of the third book I've been having conversations to expand it beyond that. I'm not certain what that will entail as of yet. Do you see a million dollar blockbuster "The Land of Stories" movie franchise in the horizon? When the first book came out I was completely against doing a film. I wanted it to have a life as a book first. I also hated how movies are seen as conclusions to books, rather than a continuation. However, since it's currently the highest series on the NYTBSL without a film franchise behind it I think it's safe to say it has had a very impressive life as a book. I'm starting the film conversations now but I just ask the readers to be patient with me. I only have one shot to do it and I want to make sure it's done well. Fan Casting alert! If you could cast any actors as Alex and Conner Bailey, who would you choose? I'd want them to be unknowns. I'd want every kid in the theater to feel like Alex and Conner could be their best friends and have come from anywhere but Hollywood. We know your grandmother has been a huge supporter of your writing career. Was she the inspiration for the Bailey twins' grandmother? My grandmother has always been such an important part of my life and the twins' relationship with their grandmother mirrors that. She's more of a "Mother Goose" but I tell her the "Fairy Godmother" is totally her! According to our research, "The Land of Stories" had been lingering in your mind since elementary school. How did it feel when you finally managed to publish the first book? It felt like I had been in labor for seventeen years and was finally able to give birth! It was always at the top of my bucket list. I can't even describe the relief I felt when it was finally published. "Glee" is closing its amazing run with a final season in 2015. Where is your acting career taking you next? I'm playing Noel Coward in a bio-pic as soon as we wrap Glee. I'm also attached to a bunch of other projects, some I'm personally writing and others I'm not. It's too early to announce any of them though. I'll definitely be busy for the next couple of years. You've definitely proven your musical prowess in "Glee". Do you see yourself releasing a solo album in the future? I don't think so, but never say never. Singing has always been a great tool for me but not something I wanted to pursue on its own. I've made a lot of promises that I'll keep singing somehow, so I now have to figure out how I'm going to pull that off. Your character in "Glee" is obsessed with making it big on Broadway. Do you see yourself starring in a Broadway show in the future? I certainly hope so! Hopefully the right part will come along at the right time. I'd never forgive myself if I didn't at least try! What did you feel when you won the Golden Globe in 2011? Adrenalin. I completely blacked-out from nerves and don't remember a thing. I don't even remember hearing my name called - I just remember everyone at my table jumping to their feet and Ashley Fink dragging me up. The next thing I knew I was backstage with a very heavy and shiny object in my hand. I've watched my speech on YouTube quite a bit and am shocked I kept it together. I'd like to publically thank whatever angel or alien possessed my body in that moment and made me sound articulate. Many of your fans are teenagers who are struggling with the pressures of growing up. What advice would you give to them as they journey into the real world? Hormones are not your fault and you can't outsmart them. Don't blame yourself for feeling things you can't control. Trust me, you leave the human race around twelve years-old and don't come back until you're in your early twenties. Once you return you'll see the world isn't nearly as hard as it seems. You don't even care about half the things you used to obsess over. And most of us sweat less too! Exercising saved my sanity - I would take it all out on my treadmill because it couldn't talk back. What advice would you give to anyone hoping to write their own stories? Just do it! Don't worry about it looking nice at first. Word vomit everything out onto the page to get it out of your system, you can always go back and edit it as many times as you want. Also, don't be intimidated by other writers. If you're a living creature with something to say you have every right to - never let anyone tell you differently. Make that four, and double yes on the singing part. It's nice to get more confirmation on next future projects,.... some he's writing himself, and some others are writing/have written! Wednesday, July 30th- Jack Osbourne joins Billy Bush as co-host. Glee’s Chris Colfer, Dean Cain from CW’s Masters of Illusion and the hilarious Amanda de Cadenet from Lifetime’s Undone With @AmandadeCadenet.